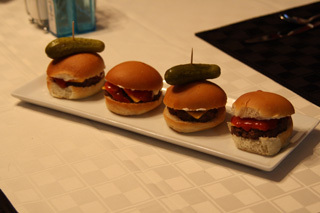 Mini food is apparently all the rage, so I decided to try my hand at arranging mini appetizers for the pleasure of my guests. My first stop was to Kohls where I picked up a set of white espresso cups with matching saucers. They are absolutely adorable! Then I popped over to Bed, Bath, and Beyond where I found a variety of mini dishes just ripe for the buying. They had everything from mini wine glasses and margarita glasses to mini spoons and forks! It was all so tiny that I was tempted to buy one of each; luckily my husband was there to keep me in check. We grabbed a set of short and tall shot glasses that we needed for arranging our mini appetizers. Next, it was to the grocery store to locate the appropriate ingredients. I started by getting the ingredients to make mini burgers with a side of fries and ketchup. Pre-heat the oven to 425F. Place fries on a cookie sheet (preferably with sides so they do not fall off). Fries take approximately 17-20 minutes to bake. Meanwhile, mix the ground beef with roughly 1 tsp garlic powder and 1 tsp Montreal steak seasoning (or more depending on your preference) in a medium bowl. Divide into eighths and form round patties. 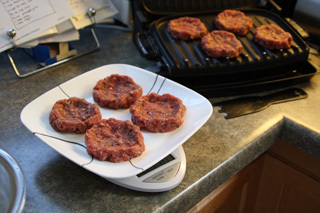 I use my Foreman Grill, but any grill or frying pan should suffice. Cook for 3-5 minutes or until outsides are browned and the juices run clear. While waiting for the burgers to cook, slice the dinner rolls and place on a serving tray. Place the cooked burger patties on sliced dinner rolls and assemble your favorite ingredients. 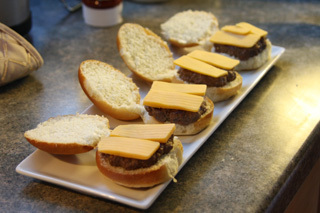 I topped ours with cheese, ketchup, and mayo to keep it simple, but you could easily add any number of toppings. 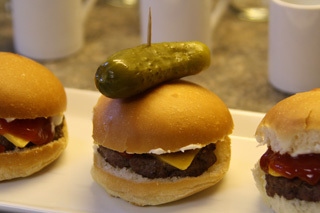 Just remember: this is a mini burger! 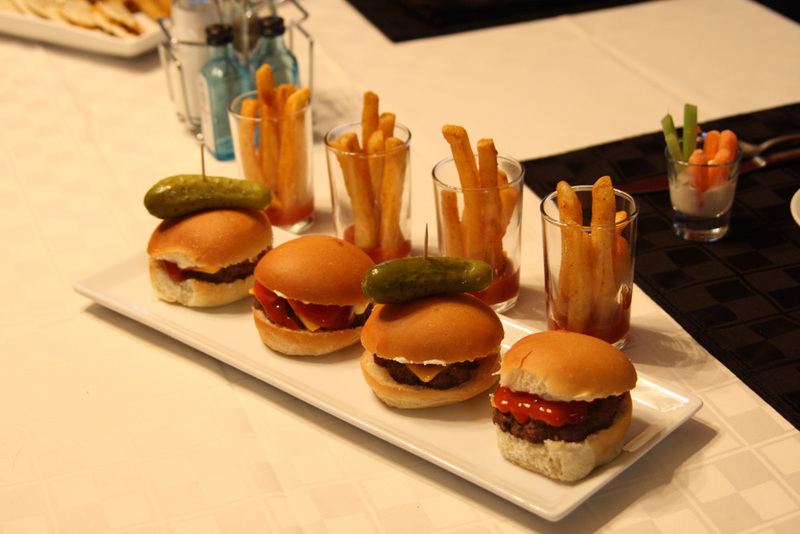 While the fries finish cooking, take out the tall shot glasses and add about 1 tbsp of ketchup to the bottom. Then place 5-6 fries in each shot glass. Serve the burgers and fries together and watch your guests enjoy the small, but tasty portions of an old classic! It's a great way to entertain your summer guests!